You will need an adult to play with. You will also need two dice and cards with the numbers $1$ to $12$ on them, which you can print off from here. Or you could use the interactive version. The aim of the game is to turn over all the cards. You can turn over the cards that match the numbers on the dice. To play the game, start with the numbers showing on all the cards. The adult rolls the two dice first. They can turn over the cards which are the same as the numbers rolled. For example, if a $4$ and a $5$ are rolled, they would turn over the $4$ and $5$ cards. If a double is thrown, their turn ends. They can roll the dice again until they can't turn over any more cards. The cards that are left showing are then added and that is their score. You then take the dice and turn the cards the right way up again, and then roll the dice in the same way as the adult. You can keep on rolling dice as long as each time you can turn over some new cards. Remember that if a double is thrown, your turn ends. When you can't turn over any more cards, those that are left are added together and that is your score. The winner is the person with the lower score. It can be played with just one turn each or each player can have a number of turns that you decide at the beginning of the game. Can you explain your strategy? What is good about the game? What is not so good? Why? How could you alter the rules to make it better? This game can give children the opportunity to use their number knowledge. Altering the rules will give the children opportunities to explore ideas about what makes a "good" game and to develop winning strategies to play their games. Easier version: try starting with just the numbers $1$-$6$. 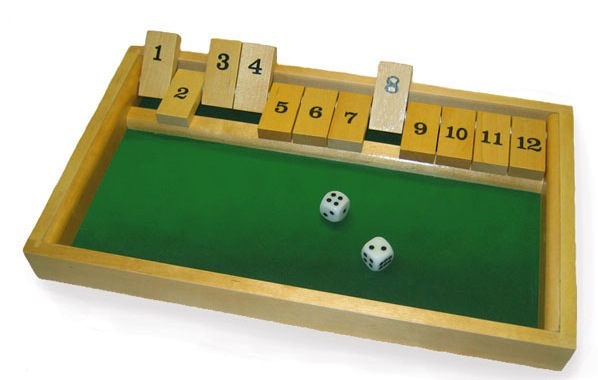 Harder version: try inventing new rules, or adding, subtracting or multiplying the scores on the two dice together to find the number to turn over. You could also change the rule which ends the turn when a double is thrown. Games. Multiplication & division. Interactivities. Dice. Working systematically. Addition & subtraction. Trial and improvement. Digit cards. Questioning. PrimaryGames-Number.